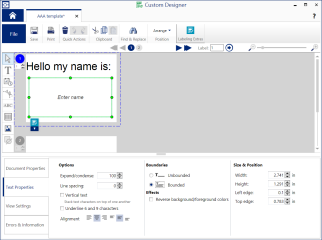 For more consistent, accurate labels, the Template Editor add-on module available in Custom Designer, Custom Designer Lite, and Text Labels editor apps allows you to set elements on your labels to be editable or locked. 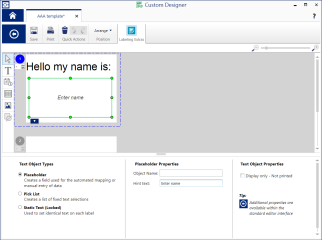 Once completed, your finished templates can be used in Print Partner or Data Automation apps to easily enter data onto your labels. Click and drag: creates a bounded placeholder object. The points where you click and then release the mouse button define the boundaries of the text rectangle. Click and release: creates an unbounded static object. The line of text begins where you clicked.